In today�s workplace, managers, leaders, and HR professionals often believe they don�t have the time to help employees navigate conflict. More often than not, however, it takes more time not to address conflict than to constructively intervene. But before you can successfully guide others in managing disagreements, you must be able to manage yourself--your mindset, presence, and behaviors. 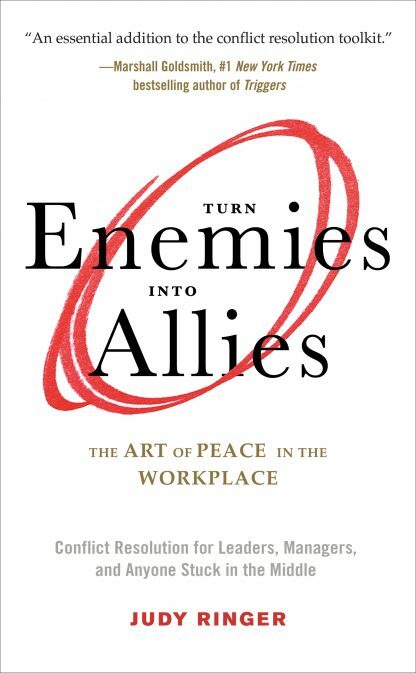 Turn Enemies into Allies offers a way of working with clashing employees that is deliberate and systematic--one that draws on the author's expertise in conflict and communication skill-building and a decades-long practice in mind-body principles from the martial art aikido. Acquire the skill and confidence to coach conflicting employees back to a professional, effective working relationship, while simultaneously changing their lives for the better. Restore control and peace of mind to the workplace. Judy Ringer is the founder of Power & Presence Training, and the author of Unlikely Teachers. An international speaker, coach, and seminar leader, and third-degree black belt in aikido, Judy brings to life essential conflict skills such as self-management under pressure and appreciation of other viewpoints. Clients include the National Institutes of Health, the Chicago Federal Executive Board, GE, Sony Corp., Honda, and Frito-Lay. Judy was born and raised in the Chicago area and now lives in Portsmouth, New Hampshire.